Locked in the heart of the Chilcotin Plateau is one of the most magnificent rivers in British Columbia. The Chilko River runs wild and free until it rushes into the much smaller Chilcotin River near the village of Alexis Creek . There, the Chilko loses its name to its tributary, and together they flow eastward until they enter the Fraser River south of Williams Lake . Wilderness rafting companies take their thrill seeking clientele down this wild river. But, for the angler, there is a much shorter section that interests them. The upper few miles of the Chilko River has some of the best flyfishing for large trout in the province. Rainbow trout and Dolly Varden char up to ten pounds are taken each year in this magnificent river. The key to the river's success is spectacularly beautiful Chilko Lake . This sixty mile long lake is nestled on the eastern side of the Coast Range. 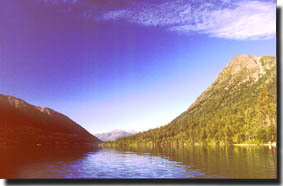 Some of the highest mountains in the province surround the western end of Chilko Lake. The glaciers provide a constant supply of cold, clear water, and give the lake its startling blue colour. The lake filters out most of the suspended solids, but enough remain to tint the Chilko river a beautiful cerulean blue. The river runs out of the lake through a narrow gap by Ts'ylos Park. There are a couple of excellent shoals near the lake outlet. After cutting through the gap the river carves out a deep hole then fans into a wide bay surrounding an island. Trout are constantly cruising on the lookout for food and rise every evening in the bay. At the tail end of the island the Chilko changes into a true river about a 100 meters wide. The current picks up speed and this is about the limit downstream for motorless craft, without having to walk back. The river flows down under the cable span and runs into the Blue Hole near the Mclean's Lodge. After the Blue Hole the river narrows and picks up more speed. It rushes through a few S bends and spreads into the relatively shallow Canoe Crossing Reach. Fishing can be quite good to the end of Canoe Crossing. Beyond that only experienced rafters or jet boats should venture. 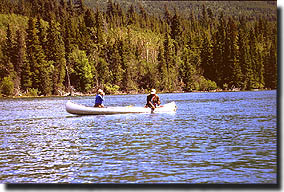 Aluminum boats with a minimum of 10 HP can still power back upstream from Canoe Crossing, but. Boaters should memorize the channels and dangerous shallow water on the way downstream. Knocking out a motor can be disastrous. Any good fishery needs an abundant food supply and the Chilko has this in spades. Chinook and Sockeye salmon return to the lake each fall to spawn near the outlet. Their eggs feed the trout and the decaying salmon carcasses provide a nutrient base for insects and small fish. The hatching salmon fry offer the trout a year-round food supply. The Chilko also has great insect hatches, and especially stoneflies. Some of the stoneflies are huge and require a size 4 long shank hook to imitate them. Golden stones are the predominant species, but there are also some huge black ones, several grey and brown species, and the ever present little Lime Sally. Caddis are also in abundance and they hatch during most summer evenings. Mayflies are plentiful, but trout don't seem to key on them as much as the larger insects. Trout usually aren't selective, and presentation is far more important than fly pattern. A variety of fly lines can be important for consistent success on the Chilko. 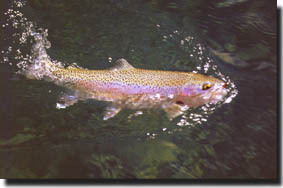 During a major insect hatch when trout are feeding near the surface, a floating line is the obvious choice. Even without a hatch, in water shallower than 2 meters, it is sometimes possible to bring a trout to the surface. A large deer hair caddis pattern is the usual pattern of choice. This happens more frequently on summer evenings than during the day. Small and medium size trout cruise the surface of the lake outlet every summer evening. These trout are usually susceptible to a well placed Lime Sally imitation. Minnow patterns and stonefly nymphs require a fast sinking line to get the fly down in the heavy current. Minnow patterns are especially effective because it's hard to fish them improperly. Trout will take a minnow tumbling along the bottom or when retrieved quickly. In contrast, a stonefly imitation must drift along drag free like a natural. 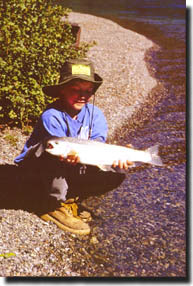 At the outlet of the lake there is a hole over 10 meters deep where Large rainbows and bull trout cruise the bottom. They can only be taken with a very fast sinking line. A Wooly Bugger, Shaggy Dragon or minnow pattern can sometimes deceive one of these trophies. The only drawback to the Chilko River is it requires a boat to fish it properly. The river is wide and deep and the forest comes right down to the shore. There are very few gravel bars shallow enough to wade. Many guide boats use jet outboard motors to run the swift river. The boats run upstream, then motors are shut off and the guides control the boats with oars while clients cast to the side or quartering downstream. When the drift is finished the boats return upstream under power. Most guides are responsible and stay clear of other drifting boats. Amateurs should follow their example. Chilko Lake is contained in Ts'ylos Provincial Park, but sections of the upper Chilko River are on private property. There are several resorts along the river that cater to anglers, horseback riders and general outdoor enthusiasts. The resorts vary from fairly rustic to truly luxurious.